The Peak Cambodia: Integrated with CapitaLand & ShangriLa. Huge Potential with Leaseback Rental Guaranteed. Invest fr U$80K. © The Peak Cambodia by Oxley • . The Super Luxurious You can Own! Direct Developer's Sale Team, No Agent Fee! Nett 55% Rental Guaranteed over 10Yrs! 1044 PREMIUM AND LUXURIOUS APARTMENTS HOT SELLING NOW! One of The Most Luxury Residential in Phnom Penh is Selling Fast! home to some 600 million people. will be completely lifted as of December 31st, 2015, meaning that the entire region will be duty free from this date. An Iconic 55 Storeys Mixed Development Towers. The Peak at Cambodia, Phnom Penh is a mix-use development along Mekong River at the heart of Cambodia’s capital, Phnom Penh, overlooks captivating views of River Esplanade, the Diamond Island and entire city of Phnom Penh. The Peak Cambodia comprising of residential apartments, office space, retail and F&B outlets as well as hotel space which consists of about 300 rooms to be managed by renowned Shangri-La International Hotel Management. The Peak is developed by reputable Singapore Oxley Holdings and Worldbridge Land (Cambodia), the same developers that had successfully launched The Bridge. The Peak is strategically located in the prime district of Phnom Penh, surrounded by the embassies, National Assembly building, the Ministry of Foreign Affairs, Aeon Mall, Naga World Hotel and Casino. It is a place where the expats are livings in. The distance to Phnom Penh International Airport is about 30 minutes only. The Peak consists of a commercial building (Shangri-La hotel) and 2 residential buildings which houses 1-4 bedrooms apartments. First phase of launching will be held in Singapore with attractive price and sales packages. Being the first and one of a kind rare development integrated with renowned Shangri-La Hotel Cambodia, The Peak boost many interesting characters and features that are unbeatable by other developments in Phnom Penh. The Shangri-La story began in 1971 with their first deluxe hotel in Singapore. 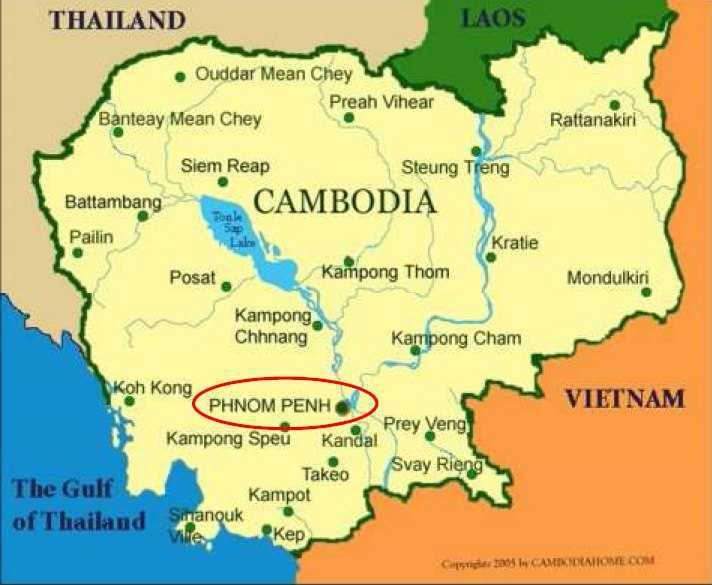 Why The Peak at Phnom Penh Cambodia? Strong demand from foreign expatriates/ elites. The Peak comes clad in stylish bronze, a definite color of luxury. The two towers comprising about 500 units each are paragons of dynamic architecture, specially crafted to bring out the finest of the site and its surrounds. The Peak offers five levels of retail excitement at your doorstep with specialty shops, chic culinary restaurants and exciting entreatment spots to top it off, not to mention more of such fine experiences in surrounding malls to satisfy your shopping desires and daily conveniences. Islands of bliss in the sky, the two landscaped sky decks on levels 13A and 55 create a unique private world of lush greenery and sparkling blue pools. The experience of recreation is complete with stunning views all around. At Level 13A, stay in the pink of health at the gymnasium. Organise a gathering with friends or family at the BBQ Pavilion, Poolside Lounge or Function Rooms. Pamper and relax at the Steam Rooms to elevate your sensory experience. On level 55, immerse in sheer indulgence on facilities crafted for your pleasure. Bask in the sun on the pool deck, wash your cares away in the jacuzzi, or be mesmerised by the breathtaking city view of the infinity pool. Take the spiral stairs down to the Sky Gym or the Sky Lounge with the beautiful scenery as your backdrop as you work out or take in a leisurely moment. Space truly comes alive in residences designed with an eye on beauty. A clean and modern style excuses sophistication yet fosters a sense of intimacy. Enhanced with spacious balconies, home becomes a destination in itself. Right in the heart of Phnom Penh City, The Peak faces the River Esplanade, standing at the crossroads of the city. Time is precious, and so is this location, for a mere minutes’ walk is all that is needed to get to AEON Mall and Naga World, as well as the National Assembly building, the Ministry of Foreign Affairs and the Australian Embassy. The independence Monument and the main Preach Sihanouk Boulevard are also a short drive away. A Place to Work, Rest And Play! The Peak Cambodia is jointly developed by two prominent property developers – Singapore-based Oxley and Cambodia-based Worldbridge Land. One of the key formulas of success in this partnership is incorporating traditional Khmer architectural themes while adhering to Singapore’s quality in building standards. Headquartered and listed in Singapore, Oxley Holdings Limited is a lifestyle property developer specialising in the development of quality residential, commercial and industrial projects. Oxley’s developments are typically located in choice areas that are easily accessible via a variety of transport modes. Most of the projects also tend to incorporate retail elements, and lifestyle features and facilities. Since going public in October 2010, Oxley has launched a portfolio of 27 distinctive developments locally and most of them met with strong market reception. Today, Oxley has expanded its property development portfolio into other regions, forming strong partnerships with other reputable developers and business partners. The Group has established a presence in the UK, Cambodia, Malaysia and The People’s Republic of China. The Group has first established it’s presence in Cambodia by developing The Bridge with WorldBridge Land, which was a success with most of the residential and commercial units snapped up as of date. In first half of 2014, Oxley launched Royal Wharf, a new waterfront township located in East London. Oxley Worldbridge (Cambodia) Co., Ltd has a long term vision to embed its brand in Cambodia’s burgeoning real estate market and with a strategy to raise our brand profile, we have produced 4 subsidiaries to manage its respective development projects: Oxley Diamond (Cambodia) Co., Ltd, that manages ‘The Bridge’ project, Oxley Emerald (Cambodia); Oxley Gem (Cambodia); and Oxley Sapphire (Cambodia). HOW CAN WE ASSIST YOU FURTHER? Simply fill up the form and our sales representative from Singapore/ Cambodia will share with you the info at the soonest, e.g Detailed Individual Floor Plans, Payment Schedules, Early Bird Discounts, Project News & Market Updates. ** For multiple units/ level purchasers, or if you’re existing client’s from Worldbridge Land, please contact us to get quote for Exclusive Sales Package.